The put in point of the Seti river at Damauli and after 2-day river rafting action take out at Gaighat bellow the Trishuli River confluence. Transferring at Damauli is accessible form Pokhara (appr.2 hr.) and from Kathmandu (appr.4:30 hr.) by drive. After end the trip, you can continue your journey to Pokhara (appr. 4-5 hr.) or Chitwan National Park (appr.1hr.) or drive to Kathmandu (appr.5 hr.). High Mountain Wave Trekking arranges also private transportation or Tourist bus to the put-in point and from the take out point at the end of trip it may depends on requirement of clients. The family classic wildness warm water river “ Seti” passes through the lime stone gorge of beautiful Pokhara valley. It has un spoilt greenish jungle scenery, excellent bird watching site, local cultural heritage and beautiful clean beaches, many small and undemanding rapids. In the monsoon season, water volume level rises up so the strength of the rapids increases and attracts rafters to challenge with its real adrenaline. The Seti River is an ideal rafting destination for those who are looking to experience some of the spectacular river line forest scenery in mid-west of Nepal without rushing of big challenging rapids. 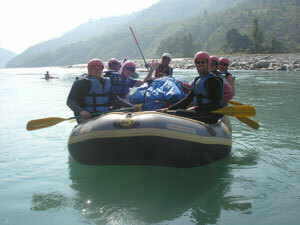 It is also very famous for family rafting trips and one of the best spot to learn kayaking in Nepal.